Want to see how a candidate fits your company before you hire him or her on permanently? 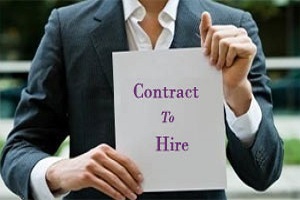 We offer contract resources for a predetermined amount of time for evaluation for a full-time position. This method allows you to give employees a chance to show you what they can do before you hire them on full-time. Don’t wait, let’s help you find employees that are a great fit and want to show off what they can do for you! Contact us today, and we will find eager candidates that would love to help your company succeed!